This week I have had the pleasure of working very closely with our school district’s Math teachers. On Monday night (Feb. 21) we hosted a dinner meeting with Middle & High School Math teachers, specifically Gr. 7-10, and school administrators. Last night, we held a similar meeting with Elementary & Middle School math teachers, specifically Gr. 1-7, and school administrators. So as not to overload anyone, we asked that the Gr. 7 teachers & middle school administrators not be the same people at both meetings. Our district has K-5 elementary schools, 6-8 middle schools, and 9-12 high schools. This year we have put some purposeful energy behind supporting and enhancing our Math instruction. Over the past number of years there has been a pedagogical shift in the B.C. Math curriculum that now emphasizes mathematical processes and the core nature of math more than simple rote memorization and drill-and-kill. This shift in pedagogy has caused some stress and anxiety amongst our math teachers, especially for those who have never utilized manipulatives, for example, as effective instructional tools. With all of that, we felt it was time to bring our Math teachers together to talk about how we develop a Seamless K-12 Math Experience for our students. We’ve done an excellent job in our district with the social transitions between our schools. As I like to say, “We have enough balloons and BBQs.” Where we need to improve is in our curricular transitions; specifically how our students transition from an elementary to a middle to a high school math classroom. Both evenings were divided into four segments (about 30 min. per). The groups were mixed by level and by schools; here’s what we talked about. 1) Common Practices between Levels: The groups discussed the commonalities and differences in five specific areas: Classroom routines, Lesson format, Practice time, the Literacy of Math, and Assessment. We certainly found a lot of overlap, but there were some differences; differences that will create a significant challenge for our vulnerable learners to move seamlessly through the system. 2) Communication Needs: Groups discussed what communication is currently working well, what further communication is needed, and whether or not the information being communicated is specific, timely, and/or useable. Communication between the adults is the key to creating effective curricular transitions. 3) Problem Solving, Differentiation, and Manipulatives: The groups then had discussion on these three specific topics. The goal was to understand how these areas were addressed at each of the levels and what could be done to bring about more alignment. Again, while there was some overlap, we were able to identify certain practices where some significant differences existed. 4) Essential Learning: We know that we always run out time before we run out of textbook, so our teachers are already making choices about when to go deep and when to move on. With that, we wanted to be a little more strategic about those choices. We discussed the concepts that are essential; which curricular outcomes are essential and which could be marginalized for the sake of deeper understandings. The example I’ve often referenced is should teachers spend more time on ‘fractions’ even at the expense of ‘statistics and probability?’ The overwhelming response from our group was ‘yes’. Some math skills are more important than others if students are going to successfully navigate the math curriculum within their schools. Grounding our students in the fundamentals – not memorizing, but knowing – will build their confidence and allow them to expect a positive outcome. If everything is a priority then nothing is. This was just the start as we still have a lot of work to do. Our goal is to create as much of a Seamless Math Experience for our students as we can. The conversations have just begun, but they were focused, deep, and constructive. We all love it when a plan comes together. These were nights where I was able to sit back and soak up the conversation; to allow the experts in the room to do what they do best! Lisa West & Steve LaPointe (our District Numeracy Helping Teachers) organized two excellent evenings of discussion and our teachers left feeling optimistic about where our math instruction was headed. …and the cheesecake for dessert wasn’t bad either! ← Enough with the Late Penalties! I enjoyed reading your post. It is always great to hear of districts coming together to talk about mathematics education. I was recently at a session with student and new teachers at the BCAMT New Teachers Conference and wanted to talk about the “big ideas” in the BC math curriculum. 90 minutes is not a long time and I settled on this as a starting point. I won’t get into the details but I found it helpful to talk about the math curriculum as being layered and the need to keep the layers in mind which I think ties into your post. I see the first layer as the one where it is necessary to ask why we study mathematics at all. 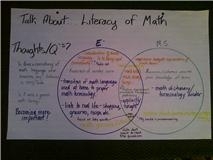 For me this is best exemplified through the terms Numeracy or Mathematical Literacy. I have since found the definition from from OECD, “Mathematical literacy is an individual’s capacity to identify and understand the role that mathematics plays in the world, to make well-founded judgements and to use and engage with mathematics in ways that meet the needs of that individual’s life as a constructive, concerned and reflective citizen” as speaking more to me. I think the definitions complement each other and in no way are in conflict. I would therefore see a need for any part of the mathematics curriculum to support these definitions in a way that is age and stage appropriate. Studies show we develop mathematical thinking early and I convinced we need to maintain and strengthen our mathematical power throughout our lives. My personal “Holy Grail” so to speak is to develop a positive disposition toward mathematics. I think there are too many people who have not achieved this and without it problems arise. Next I see the mathematics processes as key to meeting the higher level goals. I am always excited to hear educators talking about the importance of the mathematics processes in the curriculum. Finally the learning outcomes are the vehicle through which students refine and extend their numeracy/mathematical literacy. There are lots of places where people will point to failures in mathematics education but I think it is good to celebrate success as well. Great strides have been made across BC and I am optimistic that these will continue. It is great to hear of the successes in SD 67. Thanks again for a well thought out post. Thanks Richard! I would agree that developing a positive disposition toward math is huge. I think if our students can come at Math with a different mindset their success will go through the roof; if they believe they can then they will. Expecting a positive result is a difficult disposition for students to develop, but if we can cultivate it then I think our students will see Math through a different lens. Hi Tom, being a part of that meeting last night I echo your statements. 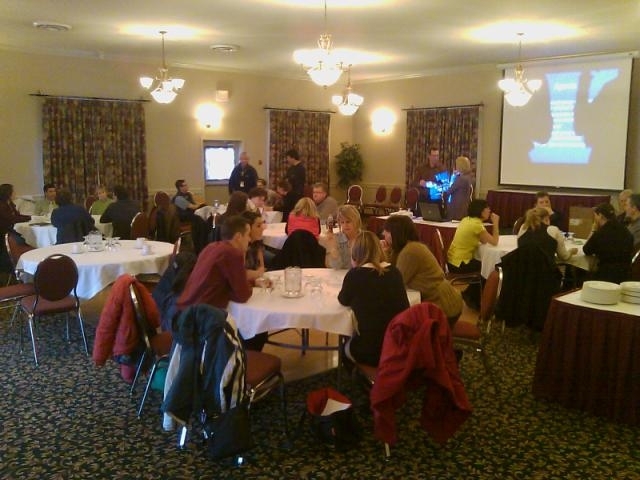 The staff that were there were energized by the discussions and the direction we are moving. There was lots of talk at school today about Math, essential learnings and quality assessment practices. At the Elementary level, there are few Math specialists and many teachers are far less comfortable with Math than Language Arts. The feeling is the discussions with Math are timely and appreciated. You didn’t mention the food – great cheesecake last night!